To end our ‘Meet the Cast’ series we talked to rising star Laurie Scott, who recently performed in the award-winning Death of a Salesman that was also directed by Joe Douglas who will direct Stand By. I remember loving being on stage from an early age, during my primary school nativity plays; I was always a bit of an attention seeker! My passion really developed when I started youth theatre at The Byre however, when I was 13.
wanted to do and since then I’ve always believed my greatest inspirations were my youth theatre days and my high school drama teacher, Patricia Esler. Since graduating I’ve gratefully accepted both projects that have come my way, Dundee Rep’s 2016/17 Season and Stand By. Generally speaking however, a great script, a great team, and a character that I can do justice to are my main criteria for choosing projects. Definitely Death of a Salesman with Dundee Rep. It’s the kind of play that sits at the top of many actor’s lifelong ambition’s list as it’s a masterpiece. To be given the chance to play the character of Happy was amazing. This production was made special by the unique visions of the director, designer, musical director and my amazing fellow cast members. I think it truly was a uniquely powerful and challenging version of the play, unlike any other I’ve come across. Thankfully, the audience and critical reception was incredible and the fact that the production won several awards was the icing on the cake of an amazing experience. It seemed like a very real and truthful play, being written by an ex-cop. The dialogue and relationships felt natural and human as well as being both funny and heart-breaking. 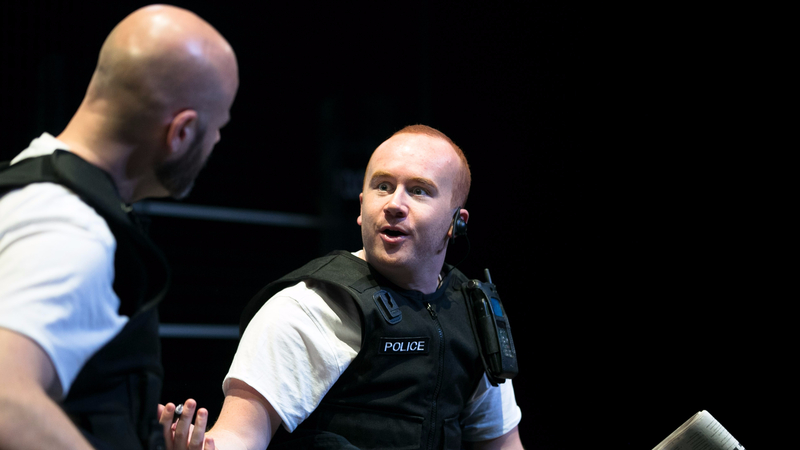 You don’t really come across cop dramas on stage and I think the concept is very exciting, from the script and design to the audience ear pieces. I’ve never experienced a show quite like it and don’t think many audience members will have either. It’s truly immersive and honest, a play about the human side of cops that isn’t often told. Laurie Scott in Stand By. It gives insight into the lives and relationships of police officers that people rarely experience. There are many misconceptions of being a copper I think, and to experience the representation through the writing of an ex-cop is very important. Marty is a bit of a Jack the Lad. He lives for the banter and is a bit work shy when it comes to the tedium of paperwork. He is slightly delusional about just how funny he is and isn’t quite the Casanova that he see’s himself as. Inherently he means well and is a lot more intelligent than he makes out, and like all the other characters he is quick to make a joke but takes the job incredibly seriously when the moment comes. He’s committed to the Force and his colleagues. I hope audiences feel enlightened and take away a healthy mix of sympathy and admiration as well as criticism and cynicism for the Police. I want them to feel that they’ve experienced a real shift for these characters, not some over-dramatised or unrealistic Hollywood portrayal. I want them to feel light-hearted as well as shocked and moved, to get at least a glimpse of just how complex and difficult police work is. 10. How ritual before going on stage, or is there a specific item you carry with you when on tour? I’m not really one for rituals or superstitions, but before every show I always run through my first ten lines, have a coffee, brush my teeth and put some Vicks on my chest. I can’t necessarily explain some of those, but works for me!